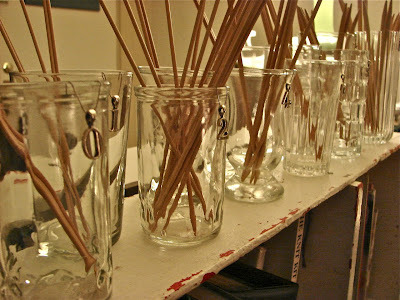 Auntie Em's Studio: Beautiful supplies say, "Create with us!" Beautiful supplies say, "Create with us!" As I look around my studio, I can't help but smile at the beauty that greets me. My supplies are constantly calling out to me to use them! Knitting needle bouquets display the tools of my trade. I have gathered an assortment of glass cups and vases which have long housed my beloved needles. Recently I added the number charms to help me find the appropriate size easily. I was thrilled with how lovely they look. My button storage has to be one of my favorite ideas. I was sick of dumping out my giant jar of buttons and sifting through them all for one or two buttons. I now have several small canning jars. Each jar houses a different color or kind of button. Of course I have one for each color of the rainbow as well as one for multicolored, wooden, metal and special buttons. To make the whole thing even more perfect, the jars fit perfectly into a little shelf that I have had for years! All in all, I love it when my supplies are works of art that inspire me to continue creating! I love it, Em! Your studio is gorgeous! !